I think it would be amazing with hash browns if you don’t want to use bread. 1. Brown sausage in skillet, then drain. 2. Slice the bread into cubes. I just took regular sandwich bread, sliced it into thirds lengthwise, then slice those thirds into thirds. It goes faster if you stack the slices on top of one another. Using the crust is fine for me, but you can remove it if you’d like. 3. Beat together eggs, milk, salt, pepper and garlic until slightly frothy. 4. Mix in bread cubes, cheese and sausage. Be sure that the bread cubes are covered in the mixture. 5. Let sit for 20 minutes. (I used this time to clean the kitchen). 7. Sprinkle the reserved shredded cheese over the casserole. 8. Bake for 30 to 40 minutes. ** Any casserole dish will work, so long as it’s large enough to fit the mixture. 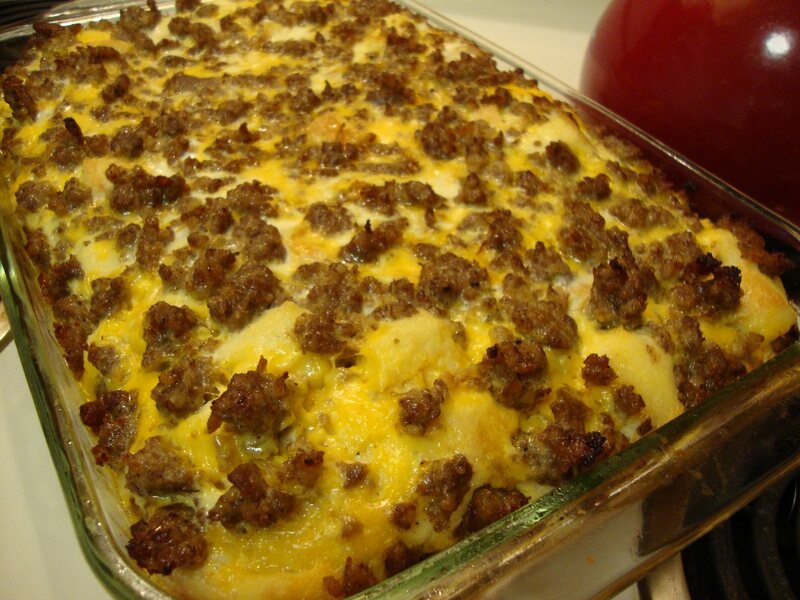 *If you want deep and chunky slices, use a smaller casserole dish and bake for 40 minutes. *Or, you can do what I did and use a large cookie sheet. Using a baking sheet spreads the mixture out thinner and makes perfectly thin slices that can be used for breakfast sandwiches. I opted for this method because I knew we were going to have leftovers. If you decide to use this baking method, you’ll likely only need to bake for 30 minutes. The amount that it makes varies according to the size of the baking dish that you use. I was able to get 12 pieces, because I used a large cookie sheet. However, the original breakfast casserole recipe that I adapted from says that it serves 8 to 10, so that sounds about right.